When Trystan Reese suggested to his husband Biff Chaplow that they have a child together, it’s the last thing Biff expected. They already had two kids — the couple had adopted Biff’s young niece and nephew who needed to get out of a bad situation. And Trystan was a man. Trystan, now 35, was assigned female at birth. By his late teens, he knew he was transgender, and he transitioned to male around 15 years ago in his early twenties. About eight years ago, he met Biff, a gay man, and they fell in love. They later married and adopted their two children. 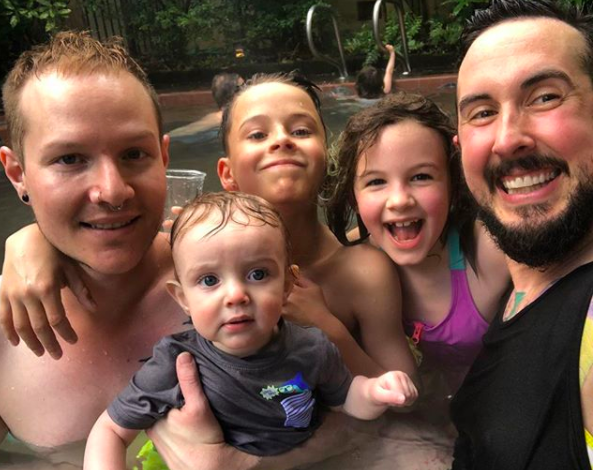 But after seeing several other trans men successfully have biological children, Trystan wanted to try adding to their family this way, even though he knew this unconventional choice would come with challenges. Despite Biff’s initial surprise, he agreed to go for it, and they’re now a beautiful blended family of five living in Portland, Oregon. Trystan currently serves as the Director of Family Formation at the Family Equality Council, a nonprofit that helps LGBTQ families, while Biff, 32, stays at home full-time with the couple’s three kids. The couple is also very active on social media, offering a window into their lives and providing helpful tips to their large following. 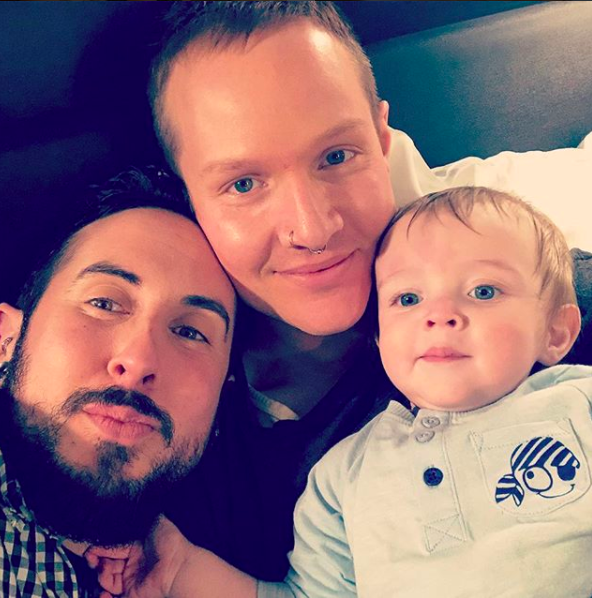 This is the story of how Trystan and Biff decided to have a biological child, what it was like being a pregnant man and his partner, and why it’s important for the couple to serve as resources for the LGBTQIA community. Profiles in Pride: How did you two decide to have a biological child? Biff: Trystan brought it to me one day, really unsuspectingly, because we’d never talked about it or anything like that before. My first instinct was to just say no, because I didn’t really think about that before; it just was not something I was thinking about doing. But when your partner brings something to you that they want, you owe it to them to give it some thought. So I said I’d think it over. I thought it over, and Trystan took some time as well. We ultimately decided that we’d go ahead and try. And we knew what that meant — we knew it would mean having a man that’s pregnant, so we knew that would get attention. We knew there could be social risks involved with that. But we went ahead and moved forward with it and had a beautiful little baby. PIP: Trystan, after living as a male for 15 years, what was it like deciding to have a biological child, which is traditionally considered more of a feminine role? Trystan: I have lots of friends who are transgender men who have had babies, so I absolutely knew it was possible and medically safe. I guess I’d seen them go through it, so it didn’t seem like an exclusively female thing to do, because I’ve known men who have done it. And being trans, I’m already used to subverting some of those norms or seeing things more loosely when it comes to gender. Most people who are assigned female at birth identify as women — I don’t — so I’m already breaking some rules. It didn’t actually seem that strange to me to embrace the parts of me that are different and sort of take advantage of them to grow our family in a way that most gay couples aren’t able to. PIP: I know that for some trans people, having to do things that are more typical of their birth gender can be difficult. Did pregnancy bring up anything challenging for you? Trystan: I just tried to focus on how cool it was that my body could grow a human being. Some parts of it were certainly really weird, but for me, it was the price that I paid to do this really amazing thing, which was to have a baby for my family and to be able to go through that experience. I just embraced the cool science part of it and tried not to give too much energy towards the part of it that was difficult for me as a trans person. Biff and Trystan when he was pregnant. Photo by Sean Black. PIP: Biff, what was it like for you as a gay man having a partner that was pregnant? Biff: As a gay man, you don’t ever really see yourself having a pregnant partner. So it’s not something that you prepare for, even in the really subtle ways other people are really prepared for. So there’s that component, but in reality, I think it was probably in a lot of ways, really the same as anybody else that has a pregnant partner. You do your best to support them. Their body is changing and doing all sorts of weird things, and you just adapt and evolve and you know it’s temporary. And then in other ways, it’s different because we obviously don’t have a heteronormative relationship. So while Trystan was the one that was pregnant, he’s also the one that’s working full-time. Then I’m home with the kids, so there’s a lot of odd things that you end up dealing with or wading through, because the answers are not really out there for you. Like at the end of the day, we’re both tired. So there are some interesting things like that happening in there, where I think we’re definitely different than most pregnancy relationships, because a lot of times, the person that’s pregnant, especially toward the end, isn’t working anymore or they try to stop working. And often times, the person pregnant is the primary caretaker of the kids during the day. So that dynamic was swapped with us, which was interesting. But Trystan honestly really didn’t need a lot of support until the last two months. Biff and Trystan. Photo by Riley Chaplow. PIP: What is it like being such a unique blended family? Biff: It’s fun! And to us, it doesn’t feel very different. It feels really normal, and you’re not reminded it’s different until you’re out in public places. It doesn’t hit you a lot of times until you’re in an uncomfortable space. Where you’re like, “Oh, they’re staring at us.” And then you remember, oh yeah, we’re not the same sort of makeup of family that people are used to seeing. But we’ve always embraced being different in those ways. I think it’s really fun to be different, and there’s a lot of beauty and love in our community, so I think it’s super fun. I feel really privileged to be a parent and have a family and do it the way that I want to do it, not the way others do. Trystan: I think that what we’re doing is what queers have always done, which is taking the pieces that are given to us and making something beautiful out of it. We happen to be two men, and there’s a uterus and eggs and sperm between the two of us, so cool, let’s make something with that! We had two kids who’d had a difficult situation be sort of thrust into our life. OK, let’s make something of it. It’s what queers have always done, and we’re carrying on the proud tradition. PIP: I saw you post on Instagram that you sometimes get very negative comments. In addition to the hate mail, have you also received a lot of support? Trystan: Yes, so much. 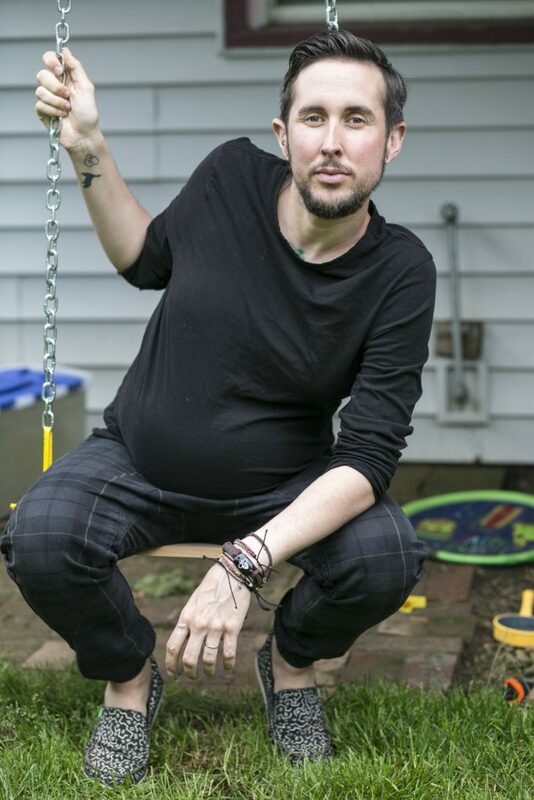 We’re the first very public trans pregnancy in 10 years. We did not expect our story to take off nearly as much as it did. We just thought maybe a couple outlets will cover it, some people will see it. But it ended up really blowing up, so we heard from hundreds of people all over the world. Our story was beamed into millions of households here in America in the nightly news. We got the full gamut, everything from “that’s so cool and amazing,” to “I have a trans kid and I want grandchildren and I thought that wasn’t gonna be possible, now I know it is possible.” All the way to “I adopted my niece and nephew too.” Just so many points of commonality from so many people all over the world. Straight people in the Midwest, and grandparents. I just did a presentation this week for a Montessori school in Salem, Oregon. A man came up to me said, “I’m a 70-year-old ex-cop, and I was profoundly moved by your presentation” and was crying. The story hits people in ways you don’t expect when you make decisions based on love, and that’s what we’ve always done, or try to do anyway. PIP: You have a big following on social media; how did people find you? Trystan: For a while, we had a public family Facebook page, where we put up pictures and talked about our adoption and things like that. We got a teensy bit of media when we adopted our older kids, like an article in People magazine, and a podcast series on us that’s been big. But we just thought, “This is cool, people want to know more about non-traditional parenting and LGBT parents and families.” We thought prior to the Trump administration, it was a real moment when things are moving quickly on trans rights. We thought this was opportunity to tell our story. People just found us there, and then I went back and realized I had an Instagram account I hadn’t used in a long time, so I reactivated that and made it for ours for our family. 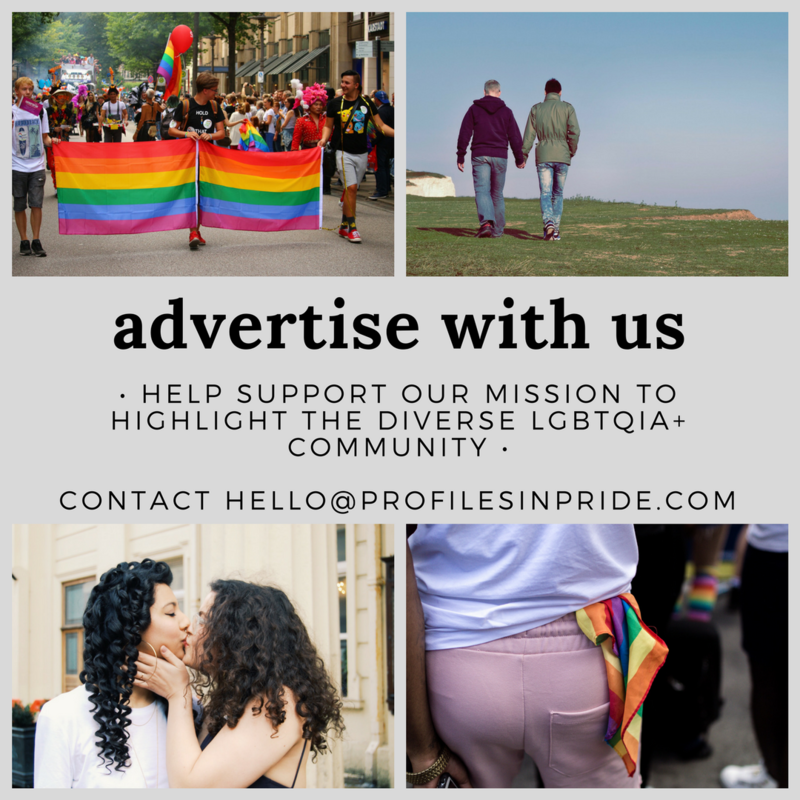 We hear from people; they find my personal Facebook profile, they find Biff’s personal one, they find our public one, they find my Instagram, they find our website and email us. Just wherever it can come in, people find a way to say something wonderful and touching or to let us know that they don’t agree with our decision. Trystan when he was pregnant. Photo by Sean Black. PIP: Is there anything else you’d like to share about your life or experience? 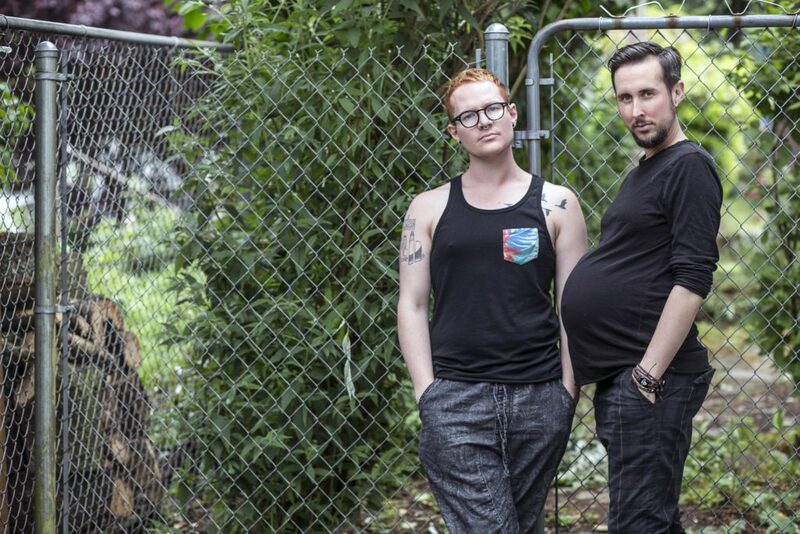 Trystan: I think because your audience is an LGBT one, for me, being “the pregnant man” has been super weird. But I love hearing from other queer people and other trans people that they really appreciate what we’ve done, that we’ve gone out there and taken the heat to make it easier for them to have those conversations down the road. For me, that’s who I’m accountable to. I’m accountable to other queer people and other trans people. To hear that any difficulty we’ve experienced has been worth it for them and made their lives easier — that’s why we’ve done it. Keep up with Trystan, Biff, and their kids on Instagram @biffandi or on Facebook. Featured photo by Sean Black.